The cuisine of the Netherlands has not exactly spread like wildfire across the globe, and in reality, even the most Dutch of Dutch folks living in Amsterdam tend to eat international cuisine as much as traditional Dutch food, if not more. Urban Amsterdam is a true melting pot of cultures, with 50% of its residents of non-Dutch origin, so finding authentic global food is a piece of cake - and just as tasty. Immigrants from around the world have settled here, but it is Indonesian food that is most popular in Amsterdam. After all, Indonesians were amongst the first large wave of foreigners to arrive in Amsterdam in the early 20th century, following the independence of the Dutch East Indies. Today, a plate of nasi goreng fried rice is one of the most beloved dinners in the city! But, if a traditional Dutch meal is really what you're after, there are plenty of options, such as an eetcaf - a sort of bistro serving affordable Dutch grub. Traditional homestyle meals include plenty of humble, filling ingredients like potatoes, sausages, root vegetables like carrots and beetroot, as well as spinach, kale, and sauerkraut. Try the snert (pea soup) or stamppot (mashed potatoes and vegetables, usually served with sausage) for a real winter warm-up. Dutch pancakes (pannekoek) are somewhat similar to French crepes, and are eating as a main meal. You can find several restaurants devoted to serving these delicious treats, which can be served topped with both savoury (cheese, bacon) or sweet (apples, treacle). Fish and seafood is an essential part of the dutch diet, and stalls selling herring (haring) can be found throughout the city. If you don't feel like sliding the fish down into your mouth whole, the traditional Dutch way (we can't blame you), try a herring sandwich with pickles and onion for a delicious, cheap treat on the street. They might be more Belgian, or Flemish if you want to get technical, than Dutch, but fries are a huge part of Amsterdam's street food scene. Slathered in mayo or even an Indonesian-inspired peanut or spicy sauce, Vlaamse Frites are simple, mouth-watering goodness. 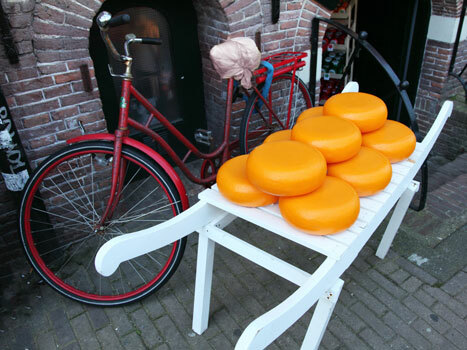 One thing the Dutch are truly well-known for is their cheese (kaas), and you only need to eat breakfast anywhere in Amsterdam to taste a couple specialties from Gouda to Edam. There are plenty of specialty cheese shops dotted around the city if you care to take a chunk home for further degustations. Eaten with a cup of tea or coffee, stroopwafel are one of the more famous Dutch exports - two thin wafers with a layer of sweet treacle filling. Some of the most famous beers in the world are Dutch, particularly lagers such as Heineken and Grolsch. Bavaria and Amstel beers are also common, but since it's easy to buy those beers at home, why not try something a little more unique in Amsterdam? There are many microbrews to choose from, not to mention the De Koningshoeve Trappist brewery, where an entire series of La Trappe beer is brewed lovingly by Trappist monks. Gin is said to have evolved from this traditional Dutch liquor, which is also, similarly to gin, flavoured with juniper. Look for bars specializing in jenever to get a real taste of the local stuff, which is available in oude (old) and jonge (young) varieties. Ask a local to show you the traditional Dutch technique for drinking a shot of jenever - hands-free!